Share "How to Introduce New Cats"
Whether you have one, two or many, cats can be wonderful members of your family. Because cats can be territorial, however, it is necessary to be cautious when bringing home a new cat and introducing it to your other feline family members. With patience and the proper precautions, you can ensure all your cats get along. If you haven't yet chosen a new cat, the exact cat you pick to add to your family can make introductions to other cats more amiable. Cats with similar behaviors and personalities are more likely to get along well, such as cats that prefer a relaxing, snooze-heavy lifestyle, or those that are more active, curious and playful. Similarly, try not to pair mismatched cats, such as a sedentary senior cat with a young, energetic kitten. If possible, the new cat will adjust to its new home better if it has previously lived with other cats, as it will be more used to sharing territory, toys and attention with others. There are easy steps you can take to minimize territorial behaviors and aggression long before you bring a new cat into your home. First, be sure your home is clean, and in particular, clean any bedding, upholstery, cat toys, litter boxes and other accessories that will hold strong scent markers of your established cat or cats. If those scent markers are reduced, the new cat will feel more at ease and less intimidated by the domineering presence of already established cats. This neutral territory will be more relaxing for all your cats as they get accustomed to one another and the new dynamic between them. Next, establish separate territories in your home for each cat. Each cat should have its own feeding space, toys, bedding, scratching post and litter box, as well as plenty of room to explore and sunshine to relax in. It will be important to keep all your cats separate for several days as they grow used to each other's scents, and giving each one an equal territory will help them feel more comfortable and at ease. Once you have brought your new cat into your home, it is time to start getting each cat familiar with each other cat. Use a towel or other soft rag and gently rub along one cat's jaws, where the scent glands that produce each cat's unique, individual pheromones are located. This will transfer the scent to the cloth, and you can then let the other cat investigate that cloth to learn the smell without being intimidated by the presence of another cat. If each cat remains relaxed with the new smell, start slowly switching bedding, toys and feeding bowls around so they are "shared" even though the cats haven't actually met one another yet. This allows each cat to continue growing accustomed to different feline scents without stress or anxiety. After several days of these out-of-sight introductions, you can slowly decrease the separation between the cats' territories. This may mean cracking a door open so they can see one another, or using a baby gate to separate rooms instead of a closed door. At first, watch the cats carefully for any signs of stress or anxiety, such as changes in appetite or litter box habits, aggression or excessive vocalization. 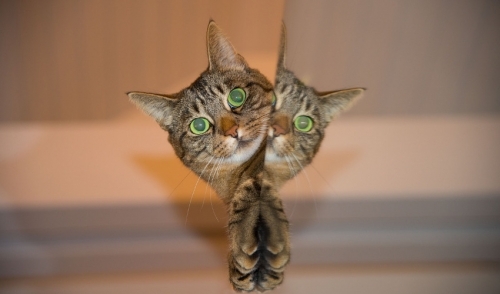 If these symptoms occur, slow down the introductions to give the cats more time to adjust. Even as you are introducing new cats to one another, be sure not to neglect any of the cats with playtime and attention. This will reassure and comfort each cat, and allow you to be a neutral party between them. Eventually, your cats will be ready to lower the physical barriers between their spaces, and they will get to know one another more directly. Keep supervising them as needed, but be aware that minor squabbles are a normal part of cats establishing a home hierarchy. More serious confrontations, however, may require intervention and additional time apart as the cats grow used to one another. Above all, be patient and positive with all your cats, old and new. They may not become best buddies, but with care, attention and gentle introductions, they can learn to get along in relative harmony.